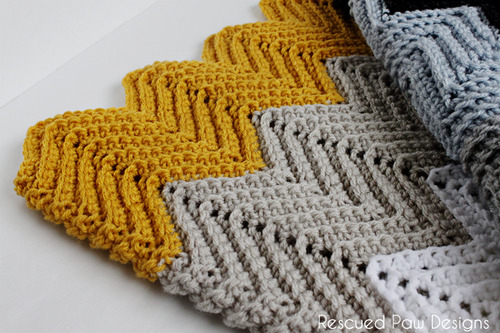 The Wonders Chevron Crochet Blanket Pattern is fun to crochet and looks so much more complicated than it really is! (My favorite!) Want to learn how to make one too? 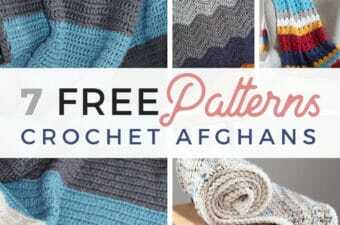 Read on down for the full free chevron crochet pattern! 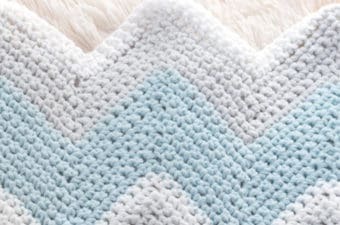 This colorful chevron blanket consists of 7 different colors, color blocked in a unique chevron pattern worked in the back loops only. Crocheting into the back loops of a stitch creates an awesome ridged look and gives projects a great texture. It’s always fun to be a little different! 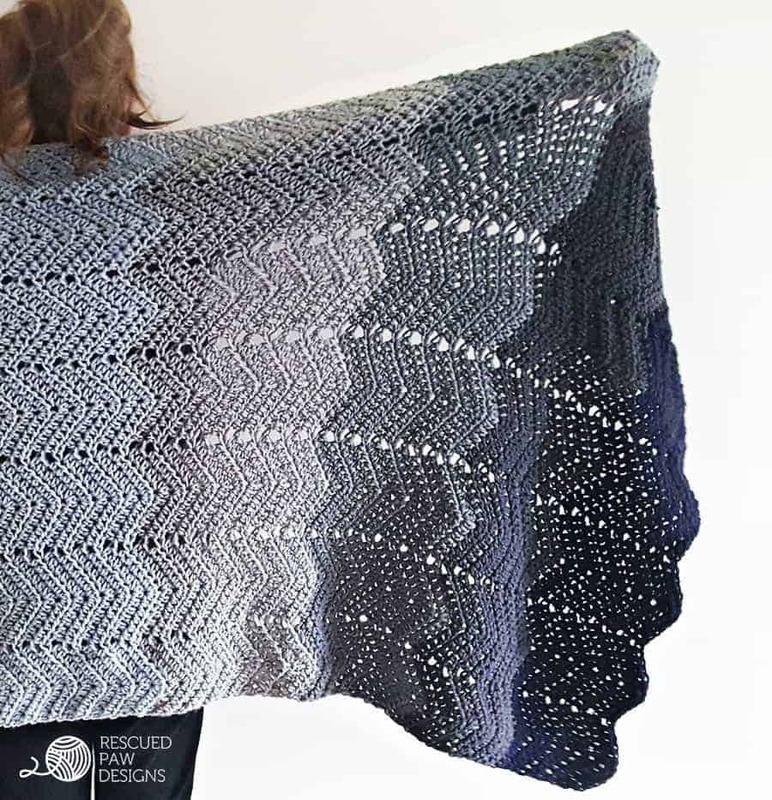 I used my favorite yarn, Lion Brand Vanna’s Choice for this project, but any worsted weight yarn would work! Click the images or links below to check out this yarn. 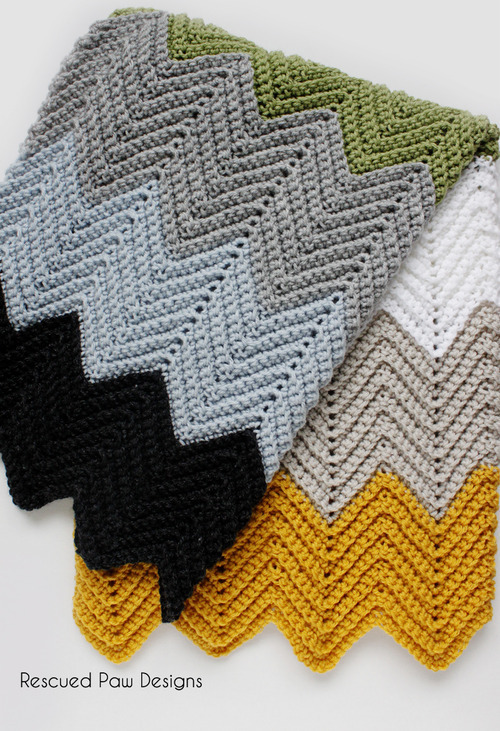 Easy to Learn Chevron Crochet Blankets! 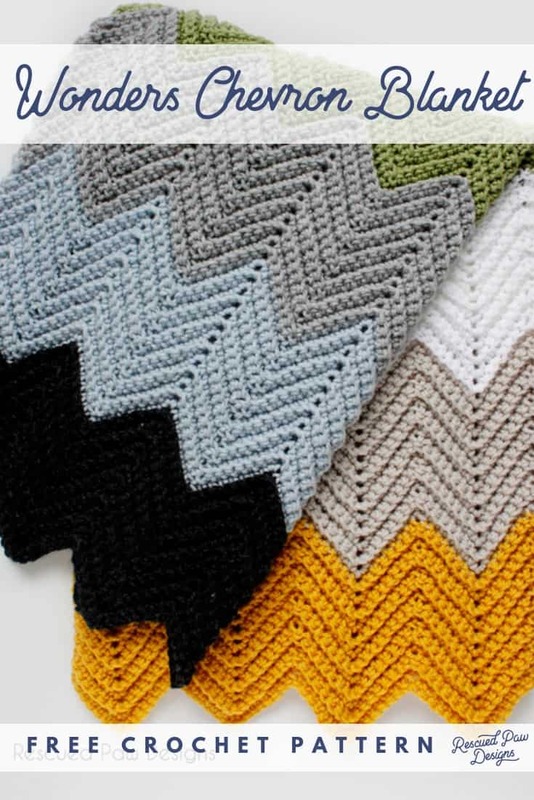 Since this chevron technique is easy to learn and uses only single crochets for the entire project it is perfect for beginners. If you are a new crocheter this would be the perfect “bigger” project to try! 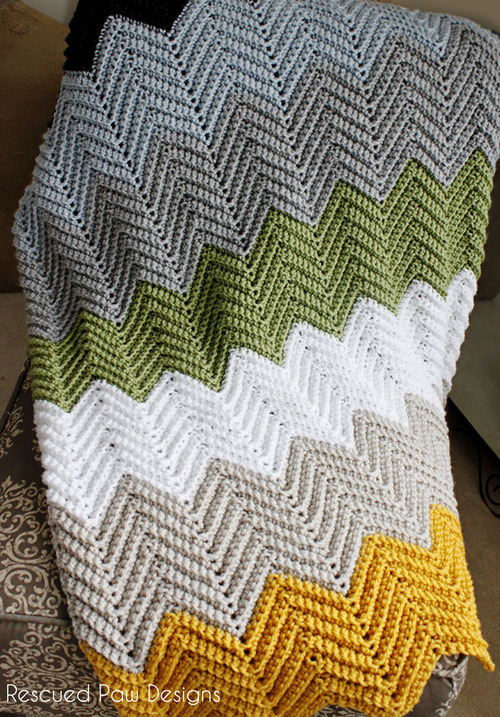 You might even like to try my Chunky Chevron Blanket too! Ready to get started on your new crochet blanket? Ready to get started? 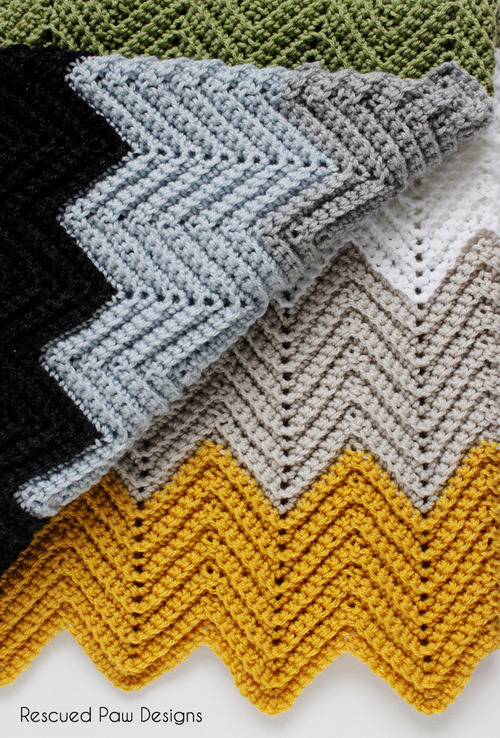 Go ahead and read on down for the full, FREE Wonders Chevron Crochet Blanket pattern. If you’d like the AD-FREE PDF version “Click Here“. Worsted Weight (4) Yarn 7 colors – I used Lions Brand Vanna’s Choice in Mustard, Linen, Silver Blue, Dark Grey Heather, Light Gray Heather, White, and Loops n Threads Brand Yarn Impeccable in Fern. SC2TOG=Single Crochet Two Together (insert hook into second chain from hook, yarn over the over the hook, and draw the yarn through the stitch so there are 2 loops on the hook, insert the hook through the next stitch, wrap the yarn over the hook, and draw the yarn through the stitch so there are 3 loops on hook. Wrap the yarn over the hook and draw the yarn through all three loops at once. Approximately 34 inches wide by 45 inches in height or the size of a baby blanket when using a starting ch of 135. If you would like to make this blanket smaller or larger start with a beginning chain that is a multiple of 17. For example: 17, 34, 51, 68, 85, 102, 119, 136, 153, 170, 187, 204, 221, 238, 255, 272, 289, 306, 323, and 340, then add on an additional 16 chains to which ever length you choose. 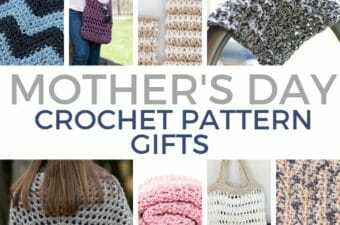 The entire pattern is worked in the back loops starting with row 2. Row 1: sc first two st’s together, 1 sc in each of next 5 chains, 3 sc in next chain ,1 sc in each of next 7 chains, * skip 2 chains, 1 sc in next 7 chains, 3 sc in next chain, 1 sc in of next 7 chains, repeat from *across ending with 5 sc’s, you will now be left with with 2 sc, sc those last two remaining stitches together (aka sc2tog), turn. Row 2: Ch 1, starting in first st sc2tog (pick up a loop in each of the two stitches you will be crocheting together, yarn over, and draw through all 3 loops on hook.) 1 sc in next 5 stitches, 3 sc in next stitch, * 1 sc in next 7 stitches, skip next 2 sc. 1 sc in each of the next 7 stitches, 3 sc in next stitch, repeat from * across until you reach last 7 stitches. 1 sc in the next 5 stitches. sc2tog in the last 2 stitches, turn. Row 14 – 26: join in second color and repeat row 2. Row 27 – 39: join in third color and repeat row 2. Row 40 – 53: join in fourth color and repeat row 2. Row 54 – 66: join in fifth color and repeat row 2. Row 67- 79: join in sixth color and repeat row 2. Row 80 – 93: join in seventh color and repeat row 2. Fasten off the end and weave in the loose ends throughout the blanket with a yarn needle. If you have any questions, please feel free to contact me on my Facebook page or leave a comment here. 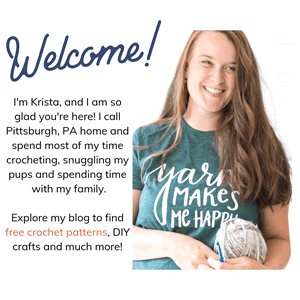 I hope you enjoyed this free pattern and as always…. Happy Crocheting! 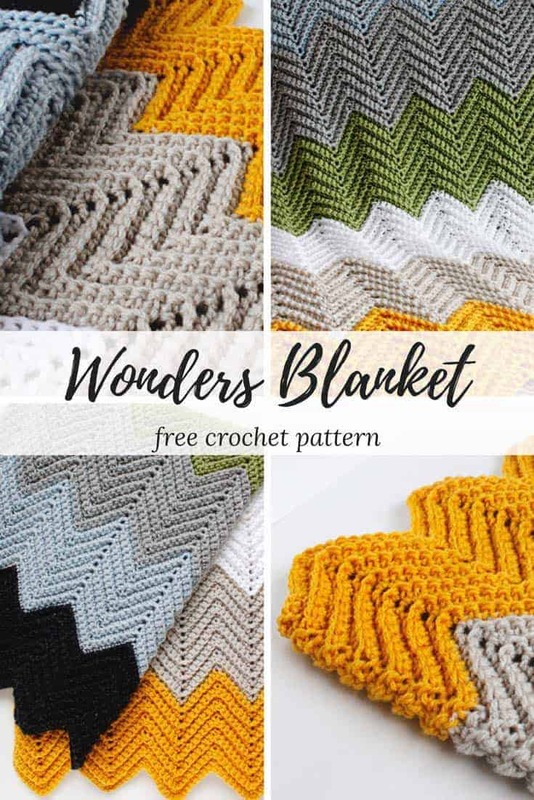 If you liked the Wonders Chevron Crochet Blanket you may also like this crochet blanket pattern too…. I am not a advanced crochet person, I know a handful of stitches and can and have made many granny square and ripple Afghans before. Always the edges looked horrible. I like your solution and have started on my first using your pattern. I think I will be extremely pleased with the results. Thank you. I have a question about this pattern. You said to enlarge,the blanket, use multiples of 17 and then add 16. However, your pattern used 136 stitches, which is a multiple of 17. Why didn’t you add the 16 stitches to the 136? Could I do this in double crochet? Hi— I’d like to make this bigger for a friend. For each additional 17 chains, will that add about 4 inches to the width? I’m just trying to calculate so I don’t have to guess! Thanks! I made a baby blanket from this pattern. I never knew the sc2tog stitch. I LOVE how clean the edges look.